At manuscript submission, each author must complete and submit the form below. This combined Author Statement-ICMJE Form for Disclosure of Potential Conflicts of Interest addresses copyright transmittal and any relevant disclosures. Open the form in Adobe Acrobat Reader, fill it out, and then save it to your computer. Upload the form with your manuscript submission in Editorial Manager. Note. Mac/Safari and Chrome users may have difficulty using the interactive form. These authors should use the Noninteractive Form, which must be printed, completed, and then scanned and uploaded with your manuscript submission in Editorial Manager. For all articles, the electronic journal (website) is the publication of record rather than the print journal. The Journal offers an author-friendly approach from submission through publication. OSLI Retina adheres to the Recommendations for the Conduct, Reporting, Editing, and Publication of Scholarly Work in Medical Journals (2013) of the International Committee of Medical Journal Editors. Original submissions are welcome, and those deemed appropriate will be extended the consideration of expert non-blinded peer review, conducted by the editors, editorial board, and members of the review panel. Accepted manuscripts may not be published elsewhere without permission. All accepted manuscripts are subject to copyediting. Ophthalmic Surgery Lasers and Imaging is now Ophthalmic Surgery Lasers and Imaging Retina, or OSLI Retina, and should be cited as Ophthalmic Surg Lasers Imaging Retina. One author should be designated as corresponding author, and his or her address, email address, and telephone number should be provided. The corresponding author will receive proofs for approval. Authors are responsible for the accuracy of all statements in their work, including changes made by the editors. Manuscripts are considered with the understanding that they are submitted solely to OSLJ Retina and have not been published previously. Before any manuscript can be considered for publication, the Author Statement must be completed in full, signed, and dated by each author. If photographs or video are submitted with a manuscript, permission to publish must be obtained in writing from all individuals pictured. Drawings or computer-generated images submitted with a manuscript require permission to publish from the artist. Authors must inform SLACK Incorporated if videos, tables, photos, or illustrations have been previously published, whether by the author or another entity. Material reprinted from other publications (including electronic media and the Internet) must be accompanied by a letter of permission from the publisher, which extends non-exclusive worldwide rights to reprint the material for all forms of media now or hereafter developed to SLACK Incorporated. Content from U.S. government websites (eg, NIH, CDC, USDHHS) is in the public domain and generally can be used without permission. However, some content on these sites may be from another source, in which case permission must be obtained from the copyright holder. If any author has a competing or conflicting interest in the subject matter of the manuscript, this must be indicated. If the manuscript discusses in any way a drug, a device, equipment, or an instrument, the authors must state whether or not they have any commercial or proprietary interest in the product or company. All reported competing interests are clearly indicated on all published articles. If applicable, authors should describe the role of the study sponsor, if any, in study design; collection, analysis, and interpretation of data; writing the report; and the decision to submit the report for publication. If the supporting source had no such involvement, the authors should so state. If applicable, authors must declare whether they had assistance with study design, data collection, data analysis, or manuscript preparation. If the manuscript reports on a registered clinical trial and has been assigned a trial registration number from a public trials registry, authors should provide this information. Manuscript files uploaded for review should include continuous page and line numbers. Conciseness of expression is critical to effective communication. Available journal space remains a pertinent concept even as electronic publishing may impart an illusion of limitless publication space. Scientific rigor and relevance are the priorities of medical publishing, and concise writing is a third element that supports the journal's mission of maximizing both the quality and quantity of original information it presents for immediate use and to the literature. Full-length reports should be a maximum of 2,500 words, and Case Reports as well as Technique/Technology should not exceed 1,200 words. When other factors are equal, selection for publication will favor the manuscript that works with fewer words. Similarly, only the highest quality and necessary figures and tables should accompany manuscripts. Efforts to limit the length of manuscripts not only will result in the ability of the journal to publish more clinical science, but will serve readability, reader interest, and ultimately, accessibility to needed information. Verbosity and extraneous elaboration are to be avoided. If a manuscript is enhanced by supplemental data that would unduly lengthen the text, the journal may, in certain circumstances, offer accompanying online­only publication of such information. Manuscripts must be written in clear, standard American English in order to be considered. References. References are to be cited consecutively in the text in superscript Arabic numerals and listed in numerical order at the end of the text, following the discussion. Once a reference is cited, all subsequent citations to it should use the original reference number. Authors are responsible for bibliographic accuracy and must check every reference in the manuscript and proofread each reference in the page proofs. Authors must have read cited works. Authors should not assume the accuracy of citations taken from a database or from the reference list of another publication; each reference should be verified from its source. No more than six authors should be listed; references with more than six authors should list the first three followed by "et al." "In press" articles may be cited by number and included in the reference list, identified as "in press." Unpublished observations, including manuscripts "in preparation" or "submitted" and personal communications, should be cited parenthetically in the text and not numbered or included in the references. Reference format and abbreviations of journal names should follow MEDLINE/PubMed. Journal article (example is one with more than six authors). Iber FL, McGonagle T, Serebro HA, et al. Unidirectional sodium flux in small intestine in experimental canine cholera. Am J Med Sci. 1969; 58:340-350. Book. Boyd W. Pathology for the Physician, 7th ed. Philadelphia, PA: Lea & Febiger; 1965:207. Chapter in a Book. Caster WC. The study of connective tissue. In: Hollander JL, ed. Arthritis and Allied Conditions, 7th ed. Philadelphia, PA: Lea and Febiger; 1966:57-64. Figure Legends. A complete descriptive legend for each figure should be included in a Figure Legends section at the end of the manuscript text, each legend identified by number corresponding to order of appearance in the text and all legends listed together in consecutive order. Sources, permissions, and any other explanatory information about the figure should be included as part of its legend. Tables. Each table should be word processed, including all headings, on a separate page. Each table should have an appropriate title. Lines should not be used to indicate spacing. Each column should be given a short abbreviated heading. Explanatory matter should be listed in footnotes, not in the heading. All necessary information must be contained in the caption and the table itself so that it can be understood independently of the text. Information contained in the text should not be repeated in a table and vice versa. If data from another published or unpublished study are used, written permission must be obtained and acknowledged fully. Illustrations. Because of the illustrative value of color figures, approved color figures will be published at no expense to the author. Digital images should be high resolution (at least 300 dpi) and saved in JPEG or TIFF format. Image files should be uploaded separately from manuscript text files. Images embedded in Word files and PowerPoint slides are not acceptable. Illustration legends, headings, or captions should not be included in illustration files. Video. For all categories of articles, authors may submit a video (no more than 5 minutes long) illustrating the technique with the article. Submitted video should be MPEG 4 with the dimensions of720 x 480 for Standard Resolution Video or 1900 x 1080 for High Definition Video in the NTSC format. If the video has audio it should already be synced with the video and in one complete file. Video will be published at Healio.com/OSLIRetina with the accompanying article. The journal follows the style guidelines delineated in the American Medical Association's Manual of Style, 10th ed (2007). Manuscript pages should be numbered consecutively, beginning with the title page. One electronic file should include the entire text of the manuscript, including the following components, each of which should begin on a new page. If applicable, authors should describe the role of the study sponsor, if any, in study design, collection, analysis and interpretation of data, writing the report, and the decision to submit the report for publication. If the supporting source had no such involvement, the authors should so state. If applicable, authors must declare whether they had assistance with study design, data collection, data analysis, or manuscript preparation. If the manuscript reports on a registered clinical trial and has been assigned a trial registration number from a public trials registry, authors should provide this information. Background and Objective: Gives brief overview of the topic and in this context states the main objective of the study. Study Design/Materials and Methods: Describes the basic design, subjects, and scientific methods (for clinical science, section title is Study Design/Patients and Methods). Reports of studies involving human or animal subjects must indicate procedures for the protection of their rights, informed consent, as well as IRB approval. Results: Gives main results of the study including confidence intervals and exact level of statistical significance. Conclusion: States only those conclusions supported by the data obtained, and, whenever appropriate, the direct clinical implication of the findings (avoid speculation). Body. Authors are advised to not exceed the maximum of 2,500 total words for the manuscript including the Abstract. Please read the section on Succinctness above. Include the headings "Background and Objective," "Patients/Materials and Methods," "Results," and "Discussion" to divide the respective sections of the text. Introduction. The introduction should not be an extensive review of the literature, but only of that portion that is pertinent to the purpose of the study and its relationship to work in the same field. Patients/Materials and Methods. Materials and Methods should be written clearly and in such detail that the work can be duplicated by others. The technique of analysis of data should be mentioned. Results. Results must be described concisely. Text, tables, and figures must be consistent and not repetitious. Discussion. The discussion should be concise, explaining the significance of the findings and their relation to previous work. lt should analyze the results, indicating statistical or clinical significance and the implications. Statements should be supported by the internal data or by published references. Shortcomings should be indicated. Speculation is to be avoided. Surgical and laser surgical reviews should comprehensively discuss all aspects of a specific disease process and treatment modality. Imaging reviews should thoroughly discuss all aspects of a specific diagnostic or experimental imaging technique. Abstract. Provide an unstructured abstract (150 words maximum). Sections. The text should be ordered into sections as appropriate to the subject. Most of the following suggested sections should be applicable for most reviews: background, historical review, natural history, care, complications, comparative techniques, conclusion, and references. Reviews should be well illustrated and comprehensively referenced. Authors are advised to not exceed the maximum of 2,500 total words for the manuscript including the Abstract. Please read the section on Succinctness above. Abstract. Provide an unstructured abstract (100 words maximum). Introduction. The introduction should not be an extensive review of the literature, but only of that portion that is pertinent to the presentation of the case, and should be approximately 100 to 150 words in length. Case Report. The report should be complete and concise and presented in 100 to 300 words, averaging 200 words. Discussion. The discussion should be approximately 400 to 600 words as merited by the subject. For Surgical Technique Articles, authors may submit a video (no more than 5 minutes Long) illustrating the technique with the article. Submitted video should be MPEG 4 with the dimensions of 720 x 480 for Standard Resolution Video or 1900 x 1080 for High Definition Video in the NTSC format. If the video has audio, it should already be synced with the video and in one complete file. Abstract. Provide a structured abstract (150 words maximum) following the model for clinical science (above). Introduction. The introduction should not be an extensive review of the literature, but should present, in approximately 100 words, the necessary background including other available techniques and the problem or limitation that the new technique addresses. Technique. The technique should be described so that the qualified reader will understand its rationale and be able to perform it. Known and potential caveats should be presented. The presentation may require 100 to 300 words, averaging 200 words. Discussion. The discussion, of 100 words, should be brief and summarize the presentation, including any useful information that is not appropriately delineated in the description of the technique, including advantages and disadvantages, possible indications, and contraindications. Manuscripts should be submitted via Editorial Manager®. Authors should contact the editorial office with questions regarding the submission process. Manuscripts deemed appropriate for the Journal will be extended the consideration of expert, pre-publication single-blind peer review by the Editor, Editorial Board and reviewers. Final decisions regarding manuscript disposition are made by the Editor, and the Editor mediates all interactions between reviewers and authors. Authors are notified by e-mail as soon as possible about the acceptability of their manuscript. Peer reviewers are required to declare all potential competing, or conflicting, interests related to manuscripts they are invited to review. A competing or conflicting interest is anything that interferes with, or could reasonably be perceived as interfering with, the full and objective presentation, peer review, editorial decision making, or publication of manuscripts submitted to the journal. Competing interests may be personal, financial, nonfinancial, intellectual, professional, political or religious in nature. They can be related to an organization or a person. If reviewers are currently employed at the same institution as any of the authors or have been recent (eg, within the past 3 years) mentors, mentees, close collaborators, or joint grant holders, they should recuse themselves from reviewing. If a reviewer realizes a competing or conflicting interest during their review of a manuscript, either related to themselves or to the manuscript authors, they should contact the editorial office for additional guidance. If the Editor of the journal authors or co-authors a manuscript, the Editor will not be involved in the peer review or decision-making process for the paper. An Associate Editor will assume those duties. If an Editorial Board member of or reviewer for the journal authors or co-authors a manuscript, that person will not be involved in the peer review or decision-making process for the paper. Reviews completed for the journal are owned by the journal and are not published. Peer reviewers are required to maintain confidentiality about the manuscripts they review and must not divulge any information about a specific manuscript or its contents without prior permission. The publisher and editor will take reasonable steps to identify and prevent the publication of papers where research misconduct has occurred, including but not limited to plagiarism, citation manipulation, and data falsification/fabrication. Per journal policy, final manuscript acceptance is contingent upon successfully passing a plagiarism software check. If an allegation of research misconduct is made related to an article published in the Journal, the publisher and editor will follow the guidelines provided by the Committee on Publication Ethics (COPE) to address such allegations. The Journal offers an open access publication option to authors of accepted peer-reviewed articles. With this option, articles are made freely available online immediately upon publication in exchange for payment of an article-processing charge of $2500. SLACK Incorporated’s Open Access Publication Policy can be found here. If your manuscript has already been accepted for publication, and you are interested in pursuing this option, please contact us at OSLI@healio.com. Only Letters to the Editor that pertain to an article previously published in the Journal will be considered for publication. The author of the article will be given the opportunity to respond. Letters may be edited for clarity or length. Letters should be no more than 400 words, with no more than 5 references and no more than 1 figure. Letter authors must disclose any competing or conflicting interests, if applicable. All letters are published at the Editor’s discretion. Letters should be submitted by email to the editorial office. Requests to publish corrections should be emailed to the editorial office. Corrections and errata are reviewed by the Editor, published promptly, and linked online to the original article. Article reprints are available through Wright's Media. The publisher works with Portico to ensure electronic backup and preservation of access to OSLI Retina content. Questions regarding the Journal should be directed to the editorial office. Authors interested in services that include English language editing, translation into English, and research communication can click here to access SLACK Author Services. Fees apply to services selected, but a 10% discount is valid until September 30, 2018 (use coupon code SLACK10). Use of SLACK Author Services does not guarantee acceptance by any SLACK journal. 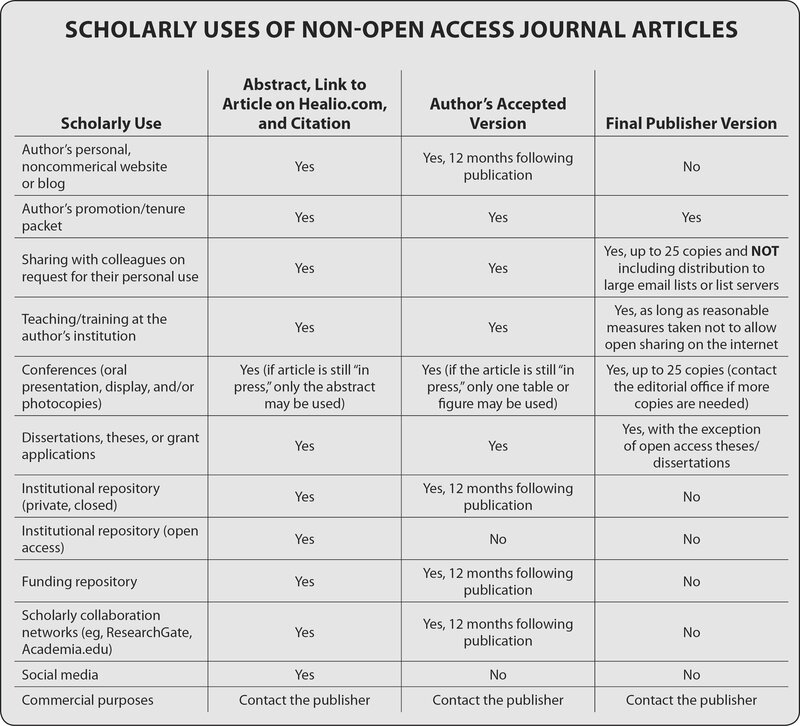 Articles that are published open access in the Journal may be shared at any time as long as the applicable Creative Commons license is observed and remains in place. For details and more information about publishing open access, access the Journal’s Information for Authors. Authors of non-open access articles published in SLACK Incorporated journals may reuse the articles only for the scholarly purposes as set out above but may NOT use or post them for commercial purposes or under policies or other mechanisms designed to aggregate and openly disseminate manuscripts or articles. This includes the use or posting of articles for commercial gain or to substitute for the services provided directly by the journal, including the posting by companies of their employee-authored works for use by customers of such companies (eg, pharmaceutical companies and physician prescribers); commercial exploitation, such as directly associating advertising with such postings; the charging of fees for document delivery or access; and the systematic distribution to others via email lists or list servers, whether for a fee or for free. Please note that scholarly social networks such as ResearchGate and Academia.edu are commercial entities and that posting the final published version of an article to these sites is considered commercial reuse. SLACK Incorporated’s journal copyright agreements enable authors funded by the National Institutes of Health (NIH) to deposit their accepted manuscripts to PubMed Central for posting 12 months following publication by SLACK Incorporated. The agreement also allows posting of accepted manuscripts on authors’ institutional repositories, with the exception of open access repositories, 12 months following publication by SLACK Incorporated. Authors should include a link to the final published article on the journal website. SLACK Incorporated will retain copyright for these articles, which prohibits republication elsewhere, and SLACK Incorporated will retain the right to charge a fee for the final published versions of these articles in whatever format they appear. For uses that do not fall within the situations listed above, please visit healio.com/permissions.